Soprano Michelle Bradley and baritone Will Liverman are two artists whose careers we have been following for some time and whose performances we have been reviewing. Ms. Bradley has dazzled us with her sizable voice heard through the Lindemann program and Mr. Liverman has been on our radar screen since he won an award from Opera Index. Mr. Noda has been one of our favorite collaborative pianists for many years. 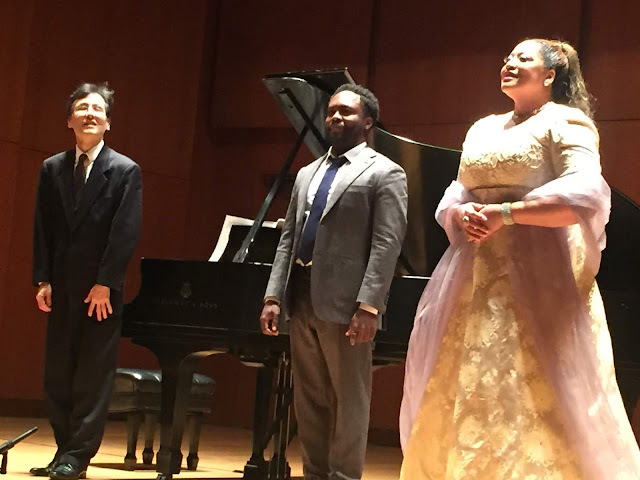 What a pleasure to have all three onstage at the same time yesterday at the George London Foundation recital series, held at the Morgan Library. The recital hall there has very lively acoustics which have been helpful to smallish voices but these acoustics kind of overwhelmed us when applied to such large voices, voices which easily fill the farthest reaches of The Metropolitan Opera House. We heard a varied program of opera and art songs, with a generous helping of Christmas music as encore pieces. Given the size of the voices we preferred the operatic arias to the art songs. Ms. Bradley's voice is perfect for Wagner, Verdi, and Strauss. We greatly enjoyed "Es gibt ein Reich" from Richard Strauss' Ariadne auf Naxos which we just reviewed Friday night in an evening of scenes at Manhattan School of Music. Ms. Bradley's upper register has power and brilliance but the depth in her lower register betrays her mezzo-soprano roots. She was every inch an abandoned princess waiting for Death. Later in the program Strauss' Ständchen was delivered with delicacy and romance, a nice contrast. We adore Verdi's La Forza del Destino and wish it would be produced more often. Still, we grab any chance we get to hear Leonora's "Pace, pace, mio Dio", even though we know that poor Leonora will never get the peace she longs for. Ms. Bradley performed magnificently in this aria and Mo. Noda's piano limned the forceful theme with urgency. We liked all of the above far more than Barber's Hermit Songs which we have heard a bit too often this year. Still, every singer gives her own interpretation and we liked the contrast between the joyful "The Heavenly Banquet" and the sorrowful "The Crucifixion". "The Desire for Hermitage" was quietly moving. Mr. Liverman was at his best in "Heiterkeit und Fröhlichkeit" from Albert Lortzing's 1842 comic opera Der Wildschütz. We were so taken with Mr. Liverman's performance that we put Lortzing's opera on our "must see" list. We believe that this joyful song is sung by the Count. Another favorite was "Grigory's Aria" from Nikolai Rimsky-Korsakov's The Tsar's Bride, an 1899 tragedy in which Grigory tries every trick in the book to win Marfa who is in love with another man but also chosen by the tsar as his bride. You just know this will not end well. Our Russian speaking companion pronounced Mr. Liverman's Russian to be excellent. We are grateful to be introduced to some wonderful music, so well sung by Mr. Liverman, and hope someday to see this potboiler onstage! In contrast, the Quatre Poèmes de Guillaume Apollinaire by Francis Poulenc seemed downright lighthearted with surreal poetry and plenty of irony in both voice and piano. We are not crazy about Ralph Vaughan Williams' Songs of Travel which seem to be a favorite of baritones. We found ourself listening more to Mo. Noda's piano which produced some amazing ripples in "Let Beauty Awake" and some gorgeously modulated arpeggi in the lively "The Roadside Fire". This banquet of music was served with a seasonal dessert. Mr. Liverman accompanied himself on the piano with a jazzy arrangement of "Oh Come All Ye Faithful" which incorporated riffs from other carols. Ms. Bradley's encore was a gospel arrangement of The Lord's Prayer. The final encore was sung a capella. Both singers took turns singing verses of "Silent Night" with a gospel inflection. The third verse was sung in glorious harmony with both artists joining voices. Several audience members were overheard commenting that the encores were their favorite part of the program.